Place In Deep Purple Story: It was here in late 1969 that Deep Purple began recording Deep Purple In Rock, with the first session taking place from 14 - 21st October, and the last around January 13th 1970. Cry Free, Into The Fire, at least some of Child In Time, Speed King and Living Wreck were known to have been cut here (although there may have been later overdubs done elsewhere). The engineers were Andy Knight and Kevin Barry using 8 track tape machines. History: The buildings are late Georgian town houses, laid out by the Adams brothers. IBC stood for the Independent Broadcasting Corporation, and the company first began life back in the 1930s recording commercial radio shows in the UK then broadcasting them from mainland Europe to get around the band on adverts (the UK press refused to carry listings for these broadcasts so IBC simply started their own paper!). The studio could also be hired by musicians and labels, and this gradually became IBC's main occupation. Joe Meek used to work here in the 1950s and learnt a lot of his craft at IBC. 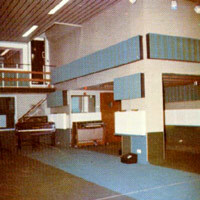 By the 60s most big UK labels had their own studios, and places like IBC would take up the slack. However some engineers began to develop a good reputation and so groups would ask to work with them, and this was the case at IBC. Indeed more would probably have been done here except they were quite slow to introduce stereo cutting for pop. The Beatles and The Stones for example both used IBC for early jobs but didn't return. It's possible that Jon Lord was an early visitor too as The Kinks cut You really Got Me here in 1964. It was The Who that became IBCs most important early customers, and they cut a lot of material here. Hendrix mastered some tracks, and IBC had an outside broadcast vehicle which was hired to record Bob Dylan live. Interestingly the makers of the Mellotron had offices in the same building and used IBC to record the original notes onto the tapes the machine used. IBC's managers didn't really have much affinity for rock and they put IBC up for sale in the early seventies, when it was bought by Chas Chandler who was managing Slade. He brought in people like George Peckham and renamed it Portland Place Studios. He eventually sold it to Jet Records and Don Arden, and it worked on, finally closing in July 1985 when it was sold to be converted into offices. There were two studio rooms. The big studio A, which was more or less two large rooms of the original house knocked through into the floor above (and still with the Adams ceiling and fireplace in). The control room looked down over the studio area. 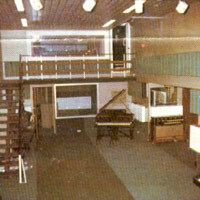 Studio B was used for overdubbing and smaller jobs. Location: Portland Place is near Oxford Circus Tube and is best approached from the junction of Oxford Street and Regent Street. Proceed north from here up Regent Street into Langham Place. BBC Broadcasting House is on the right, and this marks the start of Portland Place. 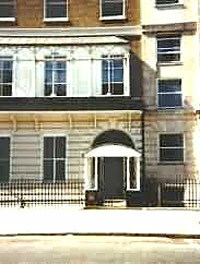 IBC were at Number 35 Portland Place. Viewing: The exterior can be seen from the street and is largely unchanged. Thanks to Brian Carroll who worked here for 12 years. The images are from an old advert for the studio, two views of Studio A as it looked when Deep Purple were there.